Target your chest for shape and tone! The chest is possibly one of the most frequently trained muscles on the body, particularly favoured for its visible location and for being motivationally influential on the way clothes sit on our upper body. This exercise takes the classic press up movement and adds in an increased demand on shoulder stability and core strength, meaning greater strength and stability at the shoulder joint, improved abdominal strength, more calories burned per set (due to the higher recruitment of the nervous system and muscle groups) and an enhanced aerobic workout! 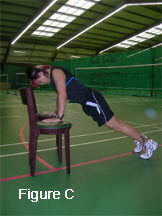 If you can't do full press ups then this can also be done from a kneeling positon. From the classic press up pose, ensuring your chest is on the same line as your hands, (i.e. shoulder directly above the wrist! ), firstly perform a a full range of motion press up (chest to floor, see figure A), returning to the start position. Then comes the add-on progression, where you need to take your weight on to one extended arm (but NOT locked at the elbow) and lift your other arm up in the air, towards the ceiling till you actually end up with an arm pointing vertically to the ceiling (see figure B). The control of this movement is crucial and this is where the demand on the shoulder stabilsers (i.e. rotator cuff muscles and deltoids), as well as the core muscles really comes into effect. Allow your feet to rotate slightly but look to keep the toes on the floor and the feet together at all times. From the 'T' position then control your body as you return to the classic press up pose, ensuring you return your hands to the original positions and your chest remains over your hands. Perform another full press up and then lift the opposite arm to the one used in the last rep off the floor to achieve the same movement. Look to alternate arms when you rotate and make sure you continue to do a full press up in between each rotation. IMPORTANT: because of the dynamic nature of this exercise you must keep checking that your hands remain wider than shoulder width and your upper body remains directly over the top of your hands. 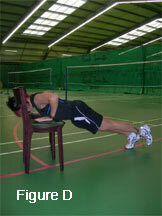 Failure to do this can encouage overuse of the shoulders, neck and lower back. An incline press up merely denotes a change of angle from which classic press ups are performed but are a powerful way to put more emphasis on the lower part of the pectoralis major muscle fibres that shape the lower cut of the chest area. You simply need to have your hands on a safe,stable surface (i.e two chairs, see figure C) so that your upper body is higher than your feet, creating an incline angle. To add a further dimension consider trying the press ups with one foot off the floor (figure D), achieved by simply pointing the toe of one foot. This creates a slight imbalance through the body that the core muscles are forced to cope with, therefore providing more core muscle activation, exercise intensity and subsequent benefit! Aim to work up to 15 reps, with slow, controlled movement, alternating the foot you have off the floor in each set. Exercise How long/many? How often? You could use the above routine on its own or in conjunction with other body part routines to create a workout duration and volume to suit you. Enjoy!